In society–but especially in an institution such as prison–there are “grasshoppers” and “ants”, the former stuck in the mud of today and the latter acknowledging the idea of a future. “Comic Sans” portrays these two types of people and their fates as the power grapple in Litchfield progresses. 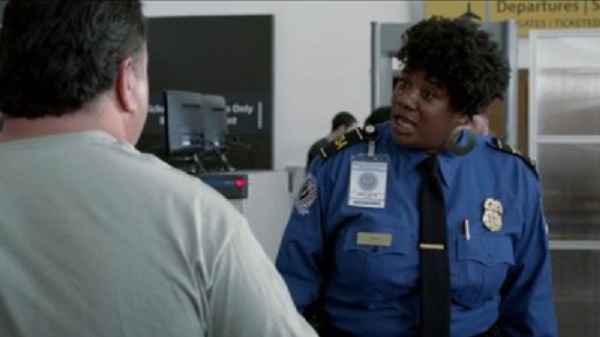 Black Cindy is the epitome of an ant, someone who, through flashbacks, we see was a TSA agent who constantly abused her power and had as great a time as she possibly could. Her whole deal is living in the now, and that’s certainly an admirable position for her, considering she’s locked up in prison with her thoughts. It’s entertaining watching her strut around without a care in the world, standing up to Vee and serving as a nice refresher from the perpetually encompassing prison walls and the authoritative Vee. However, this kind of outlook can’t last forever. We find out that Cindy had a daughter, Monica, who she gave an iPad to and sang with in her car. Those moments are fleeting, though, and this is an example of someone who’s attempting to take on responsibility she can’t take on. She’s not ready, and her inability to sustain her given attention–as exemplified by the fact that she leaves Monica in the car, then extends the promised time by quite a bit–hurts her relationship with her mother. Just like that kind of outlook can’t last in her past, it also can’t last in the prison. The cigarettes are a manifestation of power, objects that everyone wants even if you don’t like them. We’ve seen how Poussey and Taystee go along with Vee’s power plays, and now, we see how Cindy does: after Vee climbs onto her bed at night and verbally destroys her, she acquiesces to the demands, deciding to “take [her] medicine”. She’d like to continue along her path, but she realizes that if she doesn’t introduce some rigidity into her life, she’ll be a loser, as Vee says, and her life will implode. On the other side of the ant-grasshopper divide, we see Bennett still trying to recapture the fun he had with Daya early on–allowing him to be manipulated by Flaca and Maritza–and he finally realizes what this pursuit has been doing to him. Of course, being a grasshopper when you’re a guard doesn’t hurt you as much as it may the people you’re guarding, because as Daya puts it, she’s “just an inmate…[who has] nothing”. We also see a new side to Figueroa that involves her closeted husband, and while it’s nice to have a bit more about her character, it’s also a pretty awkward scene that I’m not sure works all too well. Finally, we get to the true heartbreak of the episode: Jimmy’s “compassionate release”, a decision made by the prison under the guise of harmless, ironic words. She’s always been a bit of comic relief, but last week and this week make for a one-two gut punch of emotions; here’s a woman who the system has no use for at all, who’s a grasshopper not because she chooses to be one, but because she can’t be anything else. It’s a heartbreaking situation and a heartbreaking final scene, and there’s nothing anyone can do about it. -As the season progresses, I do believe we’re starting to see problems seep in, most notably that of Vee. Her influence is taking away some of the uniqueness and the richness of season one and replacing it with manufactured tension, and while it has led to nice character development, I’d like to see something different. -Larry and Polly get it on, like we knew they would since forever ago. -I’m really enjoying the “Big House Bugle” prison newsletter storyline. It’s just plain fun watching everyone figure out what she wants to write and whatnot, and I have a feeling this is going to bring Fig and Healy even more into the fold. -I’m fine with the comic sans font, and I don’t care if I’m the only one.